With 140+ inches of average annual snowfall, the Lake Wenatchee area is a true winter recreation paradise! Downhill Skiing & Snowboarding. Lake Wenatchee is centrally located between two of the region's best ski resorts, Stevens Pass and Mission Ridge. Of the two, Stevens Pass is the closest, located only 30 minutes from Lake Wenatchee. A wonderful alternative to the larger ski resorts is the Leavenworth Ski Hill. With affordable $10 daily lift tickets and the charm of a small, hometown ski hill, this has always been a local family favorite. Cross-County Skiing. There are numerous groomed trails in the Lake Wenatchee area for cross-country skiing. 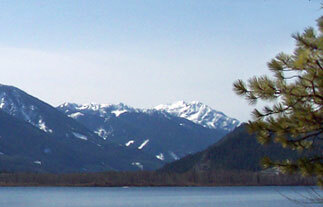 The two closest and best known areas are the Lake Wenatchee State Park and Chiwawa Loop Snow Park. These trails are exclusive for cross-country skiing (no motorized vehicles). There are also groomed trails within the Kahler Glen Golf & Ski Resort, and these trails tie together with the Lake Wenatchee State Park. Property owners in Kahler Glen have the unique opportunity to access 30+ km of groomed trails right from their doorstep! If you don't mind sharing the trails with snowmobilers, there are several great back-country routes accessed from the Fish Lake Snow Park . Many local skate skiers love to hit the un-tracked groomed trails early in the morning! A short 20-30 minute drive away, there are great cross-country ski options at both the Stevens Pass Nordic Center and in the Leavenworth area. To rent cross-country skis or snowshoes locally, Plain Hardware is open 7 days a week with nice selection of rental equipment. Snowmobiling. The Lake Wenatchee area boasts hundreds of miles of groomed and non-groomed snowmobile trails accessed from the Fish Lake Snow Park. With so many trails to choose from, every day can be a new adventure! Several properties in the area, including those at Fish Lake and Chiwawa River Pines, offer access to the trail system right from your property. If you do not own snowmobiles, Mountain Springs Lodge in Plain offers guided snowmobile tours of the area 7 days a week. Sleigh Rides. Mountain Springs Lodge offers a sleigh ride just like the good old days! A two-horse sleigh, the clean crisp air, the crunch of fresh snow, sleigh bells and the carol of your choice. Enjoy a hot spiced cider by the open fire.